Showing results for tags 'av-8b'. AV-8B Harrier II Night Attack. 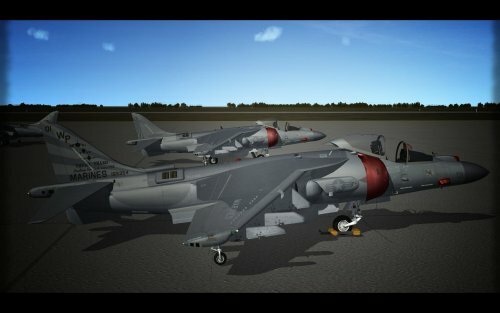 This is my humble rework of old AV-8B. Basic modding skills are required to run this mod. (copy/paste, mod folder structure etc.) A fake pilot is needed to run this mod. It is designed for and works only in SF2 series. Around 2 years ago - January 2016 - KillerBee approach me with the possibility of updating bobrock's harrier, and preparing Night Attack version. After some time, we had file ready for upload. Small changes here and there corrected a few things. And great skins by Killerbee. And then KillerBee disappeared from CA forum. Honestly, up to now, I have no contact with him. last - 4th May 2016. So harrier stayed on drive waiting for his comeback. But .... I couldn't resist...And iI started to mod this again. Since I had no KB skin templates I had to do all new skins...and more. 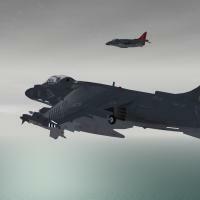 So now I am here...My standard AV-8B Harrier is already available for download and now its Night Attack model. New cockpit and a whole set of new skins and decals on whole remodeled 'old' Harrier. - there is no single part of an original model that hasn't be touched/remodeled etc. First of all...If you want to count rivets...Do not. Many things could be done other way....but I did it my way. So you have to bear with it. All skins are in 4096x4096 format. So you can easily resize down. Generally, it is just a few skins. If you have problems running this in game. Resize skins to lower resolutions. 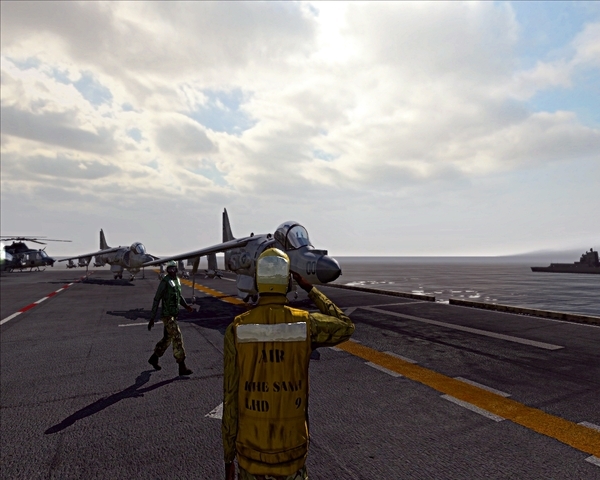 Skins match VMA squadrons from early AV-8B and late AV-8B radar version. Decals are based on my and KillerBee research. 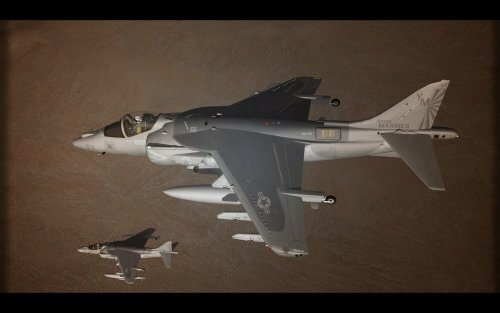 All serials are correct for the Night Attack version of Harrier II. Not always (but mostly) correct for a unit/year of service etc. But as always aircraft are rotating between units so its hard to track them down really. Big Thanks to Ravenclaw - He send me file with new ALQ-164 pod. Now it is part of the upload. For some reason, I have added weapons that are present in Loadout.ini. Animations: 1= canopy open - close 4= refueling probe - beware of a speed limit 3= night vision mode - not really helping but it is there - inside and outside animation. 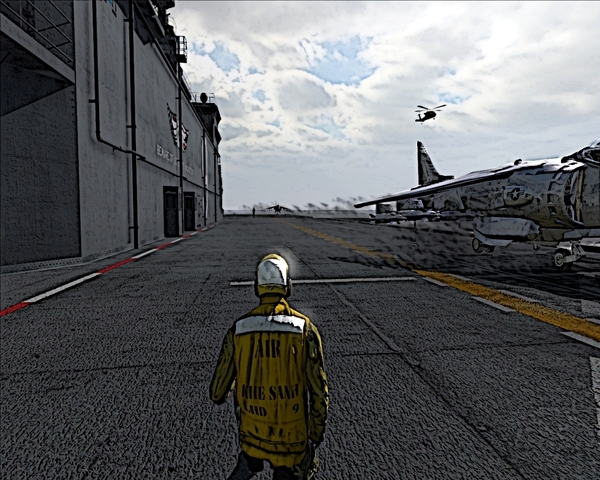 ************************************************************************************ You can exlplore ini files for some additional features like in cockpit "FLIR" feed on HUD . AAQ-28 can be loaded only on station number 5 and centerline - in real - centerline come to use later and some units (VMAT) also moded wiring for use on other pylons. But in this mod only station 5 and 4 can carry AAQ-28. There are two stations prepared for Intrepid Tiger II pod. In future. ECM also activates RWR on digital display indicator - even if ECM pod is not loaded. 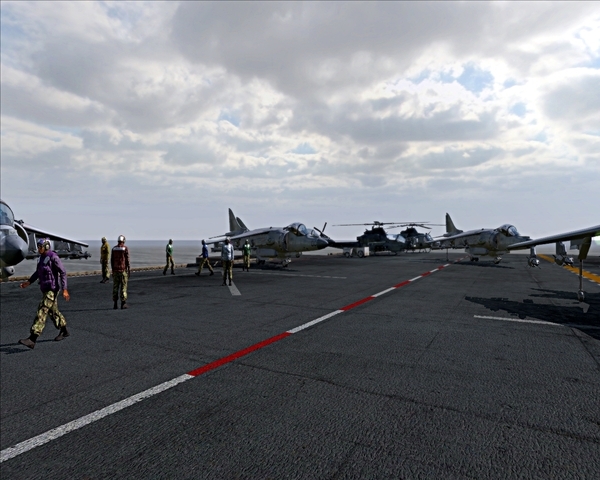 If you have my AV-8B Harrier already - some files are same so simply overwrite. I think I did not put equalizer sound file now. It is same as in previous day Harrier. for proper sound work you should add these lines into soundlist.ini SoundFilexxx=xxxx SoundFileXXX=USMComm_1 SoundFileXXX=Equalizer [Equalizer] Priority=NORMAL Looped=TRUE NumBuffers=2 3DSound=TRUE DopplerEffect=FALSE MaxDist=1000.000000 MinDist=100.000000 InsideConeAngle=360 OutsideConeAngle=360 ConeOutsideVolume=100 [USMComm_1] Priority=NORMAL 3DSound=FALSE NumBuffers=1 Looped=TRUE FrequencyControl=FALSE ************************************************************************************ Credits. Me - whole sort of strange things - model-re-model, new cockpit, skins, decals, ini files etc. Ravenclaw - BRU-42 ITER models. ALQ-164 model, weapons. AAQ-28 Pod- I don't remember who made this model - all credits to him and thank you. 331Killerbee - ideas, good words, research primary work on skins and decals, work on ini files, loadouts, effects etc. Crusaders - help with avionics ini. Sounds taken from sources offering free sound samples. bobrock- the original first version of the standard model - Thank you and thanks to KillerBee. Thanks to a lot of people who helped me with this mod...Stratos, Crusader, Geary, gurru, Soulfreak,76.IAP-Blackbird, and others. Thank you all CA users. Yes, I know its huge - but I couldn't make it smaller. Be sure to download all parts. Enjoy. I enjoyed it much when making this pack. Expect unexpected. Report bugs. Suggest changes. Reference: AV-8 TACTICAL MANUAL NWP 3-22.5-AV8B vol.I AV-8 TACTICAL MANUAL NWP 3-22.5-AV8B vol.II NATOPS FLIGHT MANUAL NAVY MODEL AV-8B/TAV-8B 161573 AND UP AIRCRAFT NATOPS FLIGHT MANUAL A1-AV8BB-NFM-000 (June 1983) a whole bunch of marines dedicated websites - that I can't remember now. seaforces.org gonavy.jp navysite.de tailspintopics.blogspot.com Squadron Signal: 1058 Harrier in Action. Squadron Signal: No.209 AV-8 Harrier in action SAM Publications: US Marines AV-8B Harrier II Aircraft Ilustrated.Special: Harrier Harrier Inside and Out by Mark Attril ************************************************************* This is freeware; it CANNOT be distributed unless permissions are granted by myself. The original readmes, if any, and all other pieces of the package MUST remain intact. The names of all contributors, modders, suppliers, etc =MUST= be listed in any new readmes. This package and any part of it may NOT in any way, shape or form be used in any payware additions. See the original readme documentation, if any, for further allowances and restrictions Any persons wishing to make further modifications, contact me first. Any persons wishing to make further modifications, MUST remember to put everyone's name in it. Bribes and donations are accepted; ************************************************************* ************************************************************* THIS AIRCRAFT MOD OR ANY PART OF IT MUST NOT BE HOSTED OR POSTED FOR DOWNLOAD ON ANY OTHER WEB SITE WITHOUT MY EXPRESS PERMISSION, OR USED FOR ANY OTHER PURPOSE THAN THIRDWIRE FLIGHT SIMULATORS, AND MUST NOT BE SOLD OR OFFERED FOR SALE BY ITSELF OR WITH ANY OTHER FILES OR MODS. ************************************************************* Kind regards. Jarek Hereda.